One of the many requirements for participants in this food study is a Bachelor’s degree from an accredited institution, preferably in engineering, biological or physical sciences, mathematics, or computer science. All applicants were required to propose research to be conducted during their time in the Mars Analog Habitat. For the results of the food study to be applicable, the working conditions of the participants must closely resemble those of astronauts who conduct research in space. I received my Bachelor’s of Science from Western Kentucky University, where I majored in Biological Sciences and minored in Mathematics. Currently, I am a second year Masters student at New Mexico State University in the Fish, Wildlife, and Conservation Ecology department. I plan on defending my thesis and graduating this May (remember Zing Phrase #13? Graduation or Death!) Since the research I proposed to the Hi-SEAS review committee is a continuation of my present research, I feel it would be helpful to introduce you to the world of algae cultivation for biodiesel production. Perhaps you’ve heard of ethanol, or another source of renewable biofuel? The energy stored in algae lipids may be refined in a similar process to create biodiesel. Microalgae are ideal sources of energy because they are capable of year-round production, require less water than terrestrial crops, and produce valuable co-products. 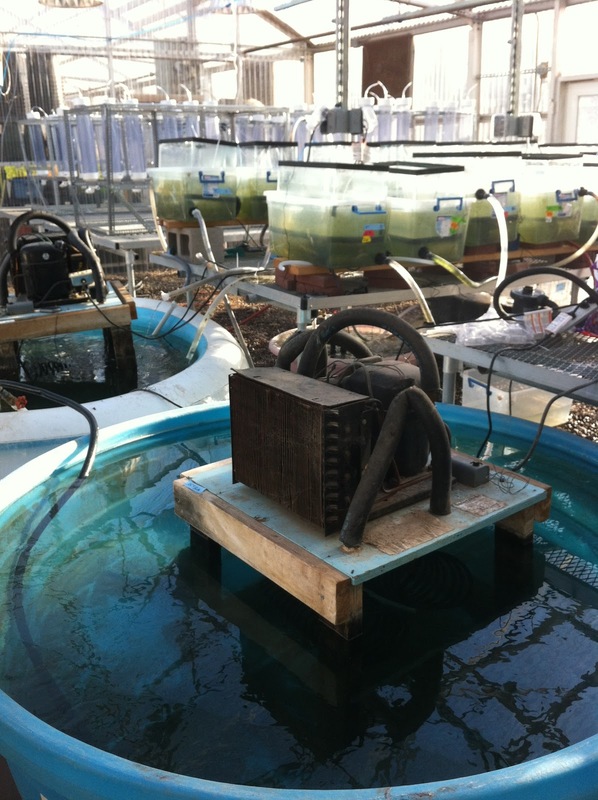 The main goal of my project is to address limitations of algae cultivation methods through an aquatic ecology approach. Increasing lipid production in these systems while minimizing the invasion of non-target algae will improve the cost of algal biofuel. The simplest approach would be to manipulate environmental factors to simultaneously promote algal growth and limit competitor or predator growth. 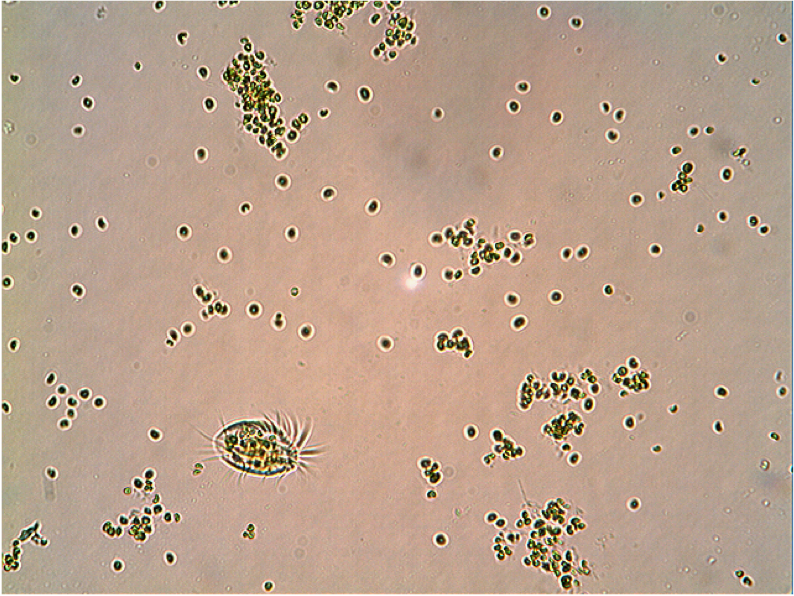 ‘Invading organisms’ are usually dispersed by the wind (and right now New Mexico has plenty of that to go around) and can include diatoms, rotifers, ciliates, and cyanobacteria. They are pests to the algae industry when they munch all the nutrients meant for the target algae or munch the target algae themselves! Samples from these experiments are later quantified by some very diligent and helpful undergraduate students. Imagine spending a few hours with your eyes glued to a microscope counting little green circles! (Note: I do not actually glue my undergrads to their microscope…yet.) Other samples are taken to a special lab on campus where I work with some very knowledgeable and helpful researchers to determine lipid accumulation. They even go a step further and investigate what different kinds of lipids are present! Once experiments are completed and data is collected and analysed, there still remains the process of writing everything up into a concise and informative manuscript. When I am ready to defend I will have a thesis with three separate chapters that cover everything I have worked on during my time at NMSU. Before I may graduate my committee must read it all and I will present my findings in a 40 minutes presentation. Eventually, each of my three thesis chapter will be reformatted into journal articles that may be submitted for publication, along with other papers I may write with data from other research endeavors. I hope you now feel confident with your new algae cultivation knowledge. More important than being able to conduct research is being able to communicate the concepts and results to the public successfully. I hope I’ve been able to do that today. Please ask questions if you are interested in learning more! I will try to speak more in depth about different aspects of the life of a graduate student. But for now, thanks for reading along with me. Please also check out my new ‘Experiences‘ tab for a taste of the fun life as a scientist can entail! Was this post helpful and informative or do I need to work on my science communication skills? Next Next post: Gizmos and Gadgets a Plenty? Interesting… So, you are studying the ways of growing “good” algae to use as fuel while keeping the “bad” algae out (or, discouraging it from growing). Is that about the size of it? If so, you communicated everything very well. If not, I might have missed something along the way, but this is not my field, so it's probably not your fault. Make sense? Also, it may have also been interesting to know a little more about a “bad” algae… Probably a plethora of those around, but maybe if you could expound on the one who is the biggest threat of invasion (and give another real world analogy to that). But, overall, I thought the piece worked well, it was very informative with some humor mixed in. Good stuff! Thanks so much for the suggestions. I'm going to keep letting some different analogy ideas tumble around in my head for a while. I added a tiny bit more about the invaders. With links to PICTURES! My lab just got a REALLY COOL new piece of equipment that will take pictures of each individual organism as it is counted. Hopefully I can get some of those up here in the future! I totally dig this, and now I feel like I understand your research so much better! I totally agree with the analogy suggestion, but, as a researcher, I'm always afraid of using the words “good” and “bad,” even in quotation marks. I think as scientists we all totally get the point of putting “bad” in quotations, but I know when I teach biology to non-majors, those sort of things are really hard for them to grasp. It's like when you try to explain how science never actually proves, it only disproves. I guess my point is, I think the use of more descriptive and maybe creative language is a better approach then going with words that people already commonly use when misinterpreting science. I would love to know some of the stats (which I know you must put in grant proposals) about the wonders of algae biofuel for the economy/US/planet. Maybe that post is coming? Ooooh I have a cool table I could use to show the wonder of algae biofuel!! (normal people never say stuff like this, right?) I'll try and find it and maybe edit this post to include it. I don't know if I have enough for a whole new post. I'll think on it. I am definitely going to try to be mindful of the language I use and need to remember that I want my posts to be accessible to a wide audience. Did Mama W. say anything more about her class on space and using the blog? I'd love love love to get some younger views and feedback. Also, I hope you're extra ready to co-write posts with me this summer and maybe over spring break?